Pull up pant leg, check lights, and generally warm up while biking on flat blocks near Powell, Mason, Chestnut, Francisco, untitil you need to go by the Post Office relay station, eying the 45 on the way to the MUNI depot. Merge quickly onto Bay St., battle Marina girls driving their Audis to the Bay Bridge. Right turn on Embarcadero. Stand on pedals as bike jitters over grate covers. Hunker down for 5 miles of blazing by parked cars. One scary moment whizzing past Market St. hoping pedestrians don’t try to jaywalk and step right in front of my bike. I cross 4 lanes and the MUNI tracks at Howard, to the Embarcadero footpath, largely empty now, and cruise a few blocks zig-zagging amongst joggers and walkers. 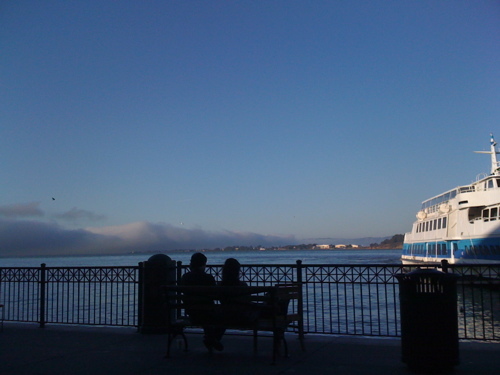 Finally, pull up to PIer 38, the incubator space for venture funds. Remember to turn all my lights off. I figured out halfway through the 5 week program at Women 2.0 StartupLabs that I could carve out some alone time at Peets on Ferry Building- and then rest my large au lait where the water bottle is supposed to be, with minimal spill. Biking from Cupertino to Palo Alto in ’94 I managed a similar coffee rest: between my brake cables I could jam a latte to-go cup. Why don’t bikes have cup holders? And last anecdote: my fingers got seriously frosted biking home one night. They were huge and red and swolen. They hadn’t been that way in the dozen or so times skiing this winter or in the Ukraine in -20. So, verifiably, biking home in “summer” in SF is colder. Written Monday, August 9th, 2010 in fitness, nostalgia, south bay. You can leave a response, or trackback from your own site. Have you used that one? I was thinking of more a water bottle holder wire frame, but a little sturdier, and upright.